I wouldn’t really call that a retcon, though. 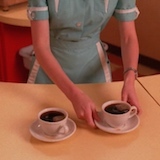 If anything, “damn good coffee” is the phrase that was actually said on the show, whereas “damn fine coffee” never was as far as I know (it was “damn fine CUP of coffee”). I spent five minutes thinking of what to say, and what I have to say is, whew. I'm not a collector. I just buy the home media and some books. That said, this is pretty nice. Going only by these photos, it actually looks like a mid-20th-century pie dish. Have any of you ever tried to contact the Showtime customer service ? Because I have a problem with them. Last year, I ordererd a Dougie standee and it went smoothly (I live in France). But one month ago, I ordererd the "Twin Peaks Powder Flats Giclee" artwork, and I've never received it (plus the UPS website can't track it down). I sent Showtime customer service three mails : no answer. I tried to contact them with another mail that I found on the paypal bill, but it doesn't work. What can I do ? Jacob wrote: Have any of you ever tried to contact the Showtime customer service ? When my ring was delayed, I called them and it all worked out great. Try calling this number: 866-352-7138. Be sure to have pertinent information ready, like the order number and your mailing information.